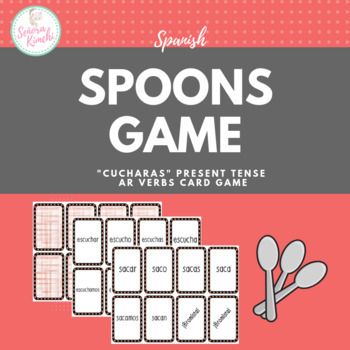 Cucharas, or Spoons, is played just like the popular card game, but with present tense stem-changing verbs! 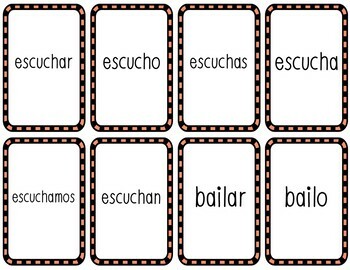 The objective of the game is to get six cards of the same "suit," the suits being the infinitive and all five matching conjugation forms (ex: infinitive + yo, tu, el, nosotros, ellos), six infinitive cards, or six of the same conjugated form (ex: all yo form cards). 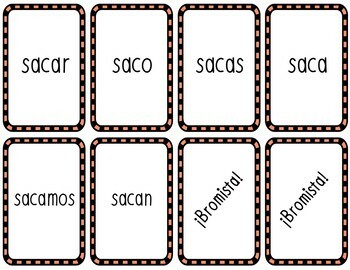 Students must pick a card from the pile, decide if they want it, and discard a card in one turn. Once a student gets six of the same suit, he reaches into the middle of the table and grabs a spoon (can be any item of your choice such as little stuffed toys or Popsicle sticks). The last student to grab for a spoon loses! Playing cards measure approx. 3.75 x 2.5 in. They can be printed single or double-sided on thick paper, card stock, colored paper, or pasted onto index cards and laminated. 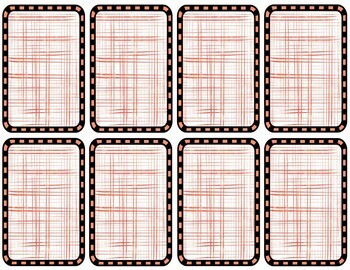 If you use both sides, choose landscape or "print on the short edge" to align the front and back of the cards.